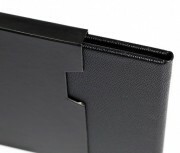 The DVD Slipcase Folio comes in a hard, black, textured, slipcase and houses a beautiful folder. When opened, the DVD Folio displays an elegant circular slip for holding a CD or DVD, while the facing surface has a pre-cut V groove window to display a 5″ x 5″ photograph. These CD/DVD Folios with presentation box are a beautiful way to present a disk and a photo or two facing photographs. 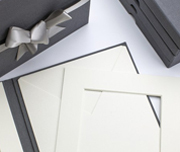 Each Folio can be tailored for your needs with the included inserts and is finished with a beautiful grey ribbon. 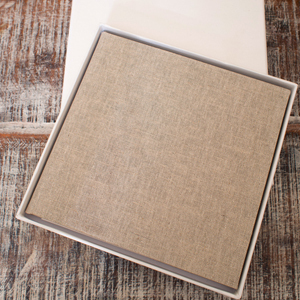 Each CD Folio comes complete with a stylish presentation box and three inserts, one envelope for a CD/DVD and two window mounts to suit a 5″ x 5″ photograph. 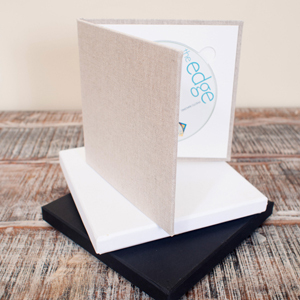 These CD/DVD Folios are perfect for those studios wanting an elegant and stylish presentation for their files. The folios come with room for a single CD/DVD and the facing surface has a pre-cut V groove mount to display one photo. The folios are available in either Black Buckram (with black presentation box) or Natural Linen (with white presentation box). ** Request your folio type in the order instructions or email through your request if printing is not required.